THE SKINNY: I love gentle scrubs to sooth dry skin and exfoliate. MD Formulations Face & Body Scrub has a simple grit that does just that. But overall, it did not impress. The scrub was gentle enough but did not have an overly pleasant aroma and you really needed a good bit of it to feel the effects. There's nothing really wrong with this product; it just seemed to lack a "wow factor" for something at its price point. KEEP OR TOSS: Keep, but I won't go looking for it at the store. 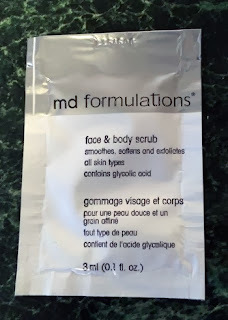 CHECK IT OUT: This product is a little difficult to find, but MD Formulations is available through Amazon.